International equipment supplier Oceanscan has added underwater acoustic positioning technology from Sonardyne International Ltd. to its rental fleet. 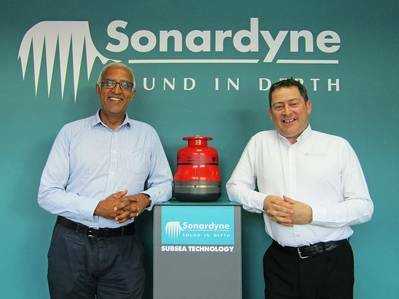 The Mini-Ranger 2 Ultra-Short Baseline (USBL) vessel-based systems and Wideband Sub-Mini 6 (WSM 6) transponders have been acquired by Oceanscan following client demand for accurate and reliable underwater tracking technology to support their projects, especially in the growing offshore wind and shallow water hydrographic survey markets. Compact, portable and quick to install, Mini-Ranger 2 offers a standard operating range of 995 meters, extendable up to 4,000 meters, and the ability to simultaneously track up to 10 subsea targets (e.g. divers, ROVs and structures) at very fast update rates. It is considered ideal for nearshore operations being run from vessels of opportunity and for construction barges that need survey grade positioning performance, without the cost and complexity of a deep water USBL system. Oceanscan’s new Mini-Ranger 2 systems are likely to be employed tracking remote operated vehicles (ROVs), side scan sonars and magnetometers for use in offshore wind construction, including unexploded ordnance (UXO) survey and debris clearance. • equipment supplier • Ranger • Sonardyne International Ltd.